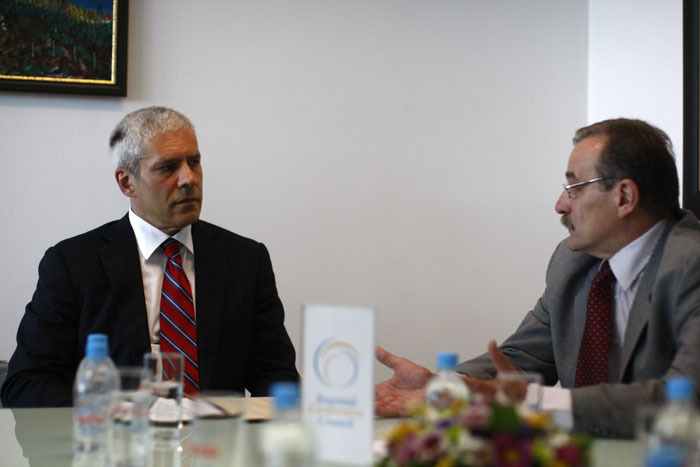 The two officials discussed joint activities following the last week’s Serbian takeover of the Chairmanship-in-Office of the South-East European Cooperation Process (SEECP), of which the RCC is an operational arm. President Tadic underlined that fight against organised crime will be the main priority of Serbia's Chairmanship. “The SEECP will also push for continuation of EU enlargement process. Cooperation in energy sector, culture, joint work on major infrastructure projects, and building capacity to respond to disasters will also be priorities of the region during the next one year”, said the Serbian President. President Tadic and Secretary General Biscevic drew attention to the importance of a strengthened regional cooperation as a powerful platform for the realization of European and Euro-Atlantic perspective of the countries of South East Europe. “Last week’s SEECP Summit in Montenegro demonstrated the need to maintain and strengthen positive trends in the region and, through joint efforts, turn them into an irreversible progress of South East Europe”, said Secretary General Biscevic. The RCC Secretary General informed the President of RCC activities in implementing the organization’s Strategy and Work Programme 2011-2013 so far, expressing belief that the Serbian SEECP Chairmanship would bring additional synergy to its further implementation. The two officials also discussed political situation in the region and agreed that remaining open issues should in no way hinder regional cooperation and overall advancement of South East Europe.